When I first posted about how to join Uber back in 2015, many people had never heard of Uber and as a consequence had no idea about how Uber worked. 3 years later, a significant number of you must have used Uber as customers and some have even gone on to join as partners or drivers. In this time also, the market has become a little bit more competitive and many more companies have joined in the rideshare market. At the time of my first post in 2015, I had a young man reach out to me. He had lost his wife during an operation and found himself in a difficult point as he was no longer able to support his kids through school and had to send them to a relative to live with. I was really touched by his story and decided to coach him to the point where he could get a vehicle on hire purchase. As he was diligent, he worked hard and not only was he able to pay off the cost of the vehicle in 12 months, but he started to help drivers get hire purchase opportunities with vehicle owners. This got me thinking. Some of the vehicle owners out there were making 50% – 100% more on the sale of their cars, not by spending more on the vehicles or paying more in advertising. They were increasing their profits by choosing to accept payments slowly. In the process, they were also helping people get financially independent, so I decided to try an experiment and see if I could make some money by doing this too. In late 2016, I tried my first HP investment with an Uber-registered driver. I got an Uber-compliant vehicle shipped to Lagos at a total landing cost (purchase cost + shipping cost) of N1.1m. I offered it to a reliable driver on a hire purchase contract with an agreement to pay N35,000 weekly for 18 months. All the payments were made into my savings account, and I tried not to touch it (although I dipped into it once or twice). Luckily for me, I entered the business before Christmas, which was peak period for the business. My driver was kept very busy and he was smart enough to make regular overpayments, especially when he made over double N35,000 on many occasions. On his highest earning week, he made N140,000. Because he overpaid several times, he was covered for weeks where he wasn’t able to meet up the full amount, and he managed to clear the entire cost of the vehicle in 15 months and 1 week, rather than 18 months. So how does the business work? Tech-based ridesharing companies (such as Uber, Taxify) focus on creating taxi app software, and they do not actually own any vehicles. These companies rely on investors (partners) like you and me to bring your vehicles and drivers on to their platforms so that they concentrate on maintaining the software that connects drivers with riders who are in close proximity. This, in a nutshell, is how the business works. I explained it all in my earlier post which you can check if you need further clarification. In this post, I want to concentrate the money-making process for partners who wish to invest their vehicles into ridesharing networks. What are the returns on investing in ridesharing? So, speaking as someone who has done this, I’ll be honest and say that my reason for investing is because my returns are higher than I would get from otherwise putting my money in a fixed deposit account or even a savings account. If I invest N2m in a fixed deposit offering 8% interest per annum, I should get N144,000 after a year (that’s N12,000 monthly). 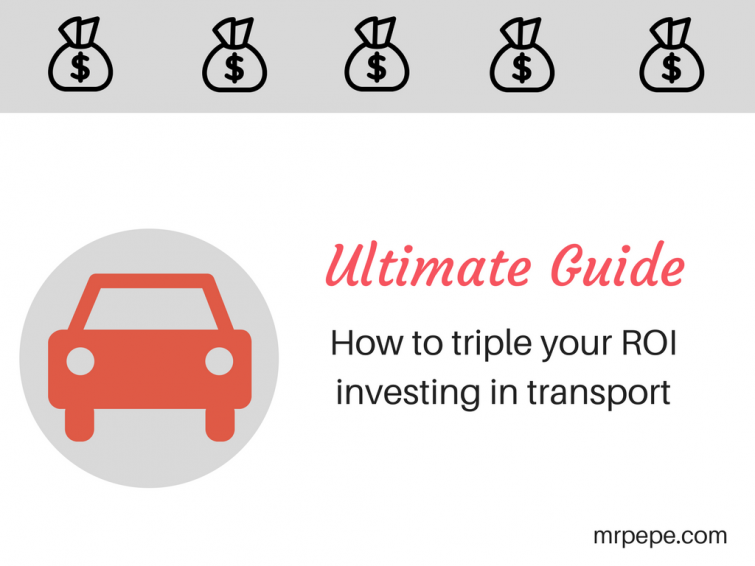 So how much can I get if I chose to invest the N2m in transport instead? So we know that things have changed since 2016, so let us raise the stakes a little higher to account for price differences since then. Imagine we purchase the vehicle for N2m and offered it on a hire purchase for N38,000 per week for 18 months. This is not double or three times the profit of a fixed deposit but SIX TIMES. 6.6 times to be precise. Granted, no investment is risk-free and you have to remember the golden rule of investments which means that if your risks are higher, then your returns are higher. This applies to all investments, and savvy investors know that the key to ensuring that your investment is not at risk is to mitigate or reduce the risks so that they are as low as possible. In the rest of this guide, I will share what lessons I have learned in my experience and what precautions and safety nets I have put in place to ensure that I make the right choices and get my full investment + profits back every single time. Earning models – Rent or Hire? If you’re not familiar with the 2 models used in this industry, you can either rent your vehicle out or offer it to a driver on a hire purchase agreement. Whichever you choose depends on what resources you have, and what you want out of th epartnership, so let us compare both models. Under a rental agreement, the driver rents a working vehicle from you for a weekly amount (which is around N20,000 – N30,000). You are responsible for taxing the vehicle, making it road worthy, vehicle maintenance if anything gets damaged, petrol etc. The driver just rents and returns the vehicle, and will never own it. Under this agreement, you agree to sell the vehicle to the driver for the business and the driver pays in weekly instalments for an 18 – 36 months. In this case, because the vehicle will eventually belong to the driver, the driver is responsible for vehicle maintenance, buying their petrol, and meeting up with any additional costs that come up. Some drivers are even happy to give you a deposit of anything between N100,000 – N500,000 to show their commitment. Most drivers on this sort of agreement return N30,000 – N40,000 weekly realistically until the balance of the cost of the vehicle is cleared. There are tools to help you put this in place and calculate this, which I will go into later in this article. Everyone has their preference, and some people ask me whether it is more profitable to rent a vehicle out or hire it out to a driver. Personally, I have always done hire purchase contracts. When we started out exploring this field, a friend of mine decided to go the rental route and it was not a pleasant experience. At first, we thought that he had juju from the village chasing him because his driver would damage the vehicle, dump it for him to fix, and then he would bear the cost of repairing, give it to another driver who would do exactly the same thing. When he had about 3 drivers mess the vehicle up, he opted out of the business and said it wasn’t profitable. It was after I discussed with my first driver that I realised that drivers renting vehicles are less likely to look after a car which they will never own. It is a psychological thing. If you see a driver as a human being who has a family like you whom he is trying to provide for, then you have to look after him and make sure that the asset you are offering is something that will provide him with value in the long term, and he will look after it. If you put yourself in the shoes of a driver who is trying to provide for his family, and you have 2 people offering you vehicles – one for rent and one for hire, which one will you go for? Some people may think renting cars to drivers as an attractive, risk-free way to earn quick, unlimited returns. Don’t be fooled. You will become best friends with a mechanic and your drivers will dump you. Register as a partner on the Uber platform. I have carefully laid out the registration process step-by-step in this post. When you start your registration process, select the option to register as a “Partner not driving”. I use this option because you can see how much work the driver is doing and Uber pays directly into your account. If the driver picks up a passenger who opts to pay cash, the cash will go to the driver but if the passenger opts to pay by card, this will go directly to your Uber account and will be paid to you on the following Tuesday, so you receive weekly payments. At the end of the week, you can settle with the driver and reconcile any differences in the automatic payments. If Uber has paid over the agreed amount, you balance the driver or if Uber has paid under the agreed amount the driver balances you to meet up with his payments. This is crucial because the vehicle you select is the asset which you are relying on to recover your investment. Many people make the mistake of purchasing vehicles that are not fuel efficient, and then they wonder why the drivers cannot meet up their targets. The key to making your money back is selecting the cheapest but most reliable compliant vehicle that you can find. Just as a guide, Uber Nigeria accepts vehicles from 2001 but for your sanity, I would concentrate on looking for a vehicle from 2005 or newer. Start by looking for a compliant vehicle 2005 or newer with low mileage with a working radio and a good air-conditioner. If you are importing your vehicle directly from abroad, there are services that you can use to check that the vehicle has not been in any major accidents by running the number plate. If you are purchasing from the UK, the check is called a HPI check and if you are purchasing from the USA, carry out a Carfax. Personally, I prefer purchasing from the USA because there is no need to convert the vehicle over to a RHD. The cheapest and best resource for purchasing vehicles from the USA is using a website called AuctionExport. This is where a lot of car importers purchase vehicles from, so you would be buying direct from the source. The site is like an eBay, but for vehicles – and they offer running vehicles, vehicles salvaged from accidents and repossessed vehicles (the previous owner purchased on finance but couldn’t meet up the finance payments). You will need a $500 deposit in your account which you can transfer by bank transfer. Once you see a vehicle you want, you place a bid and when you win, you can ask the Auction vehicle staff to inspect the vehicle on your behalf before you go through with the sale. When you decide to go through, they will give you a quote to ship the vehicle to a shipping port of your choice. What you need to do is to ensure that you have a good clearing agent for this and you should be expected to pay around N450,000 – N750,000 for the customs clearing costs. While waiting for your vehicle to arrive, this is the time to ensure that you have everything put in place to maximise your returns. Putting a process in place to track your earnings and prevent fraud is the difference between success and failure in this business. Get a dashcam. This is basically to protect your driver by recording any incident that occurs with the passenger safety. It also helps for passenger safety as well. Organise weekly vehicle inspections and accounts with the driver. Most people do this on a Sunday and they basically have a weekly meeting with the driver to inspect the vehicle, and also reconcile any differences with the account. If more cash has been accepted than card payments (which goes directly into your account), then the driver balances you. At this point, you’re almost there. You need the final piece of the puzzle – finding your driver partner. Whoever you find at this stage is the person you will trust to deliver the returns on your investments slowly over the next 1.5, 2, 3 years. Remember that you’re looking for a business partner and not an employee. You are bringing the working capital, and the other party is bringing the labour. There are things you need to look out for if you want this partnership to work for both of you. Check their medical history. Because the nature of the job is a physical one, you need to ensure that the person you are going into partnership with is fit and does not have any debilitating conditions that would render them unable to deliver, or even make their conditions worse. Get someone fit and able to put the hours in to benefit him/her and also benefit you. Hire someone with experience. You want to invest in someone who is looking for an investment in themselves, not a teacher. Look for drivers with existing good ratings because psychologists say that past behaviour is the best indicator of future behaviour. Someone who has been consistently rated as “polite”, and “good driver” is unlikely to turn around and become a thief. You want a driver who has made the sacrifice in renting a vehicle to build his/her ratings or worked as somebody’s driver just to build their ratings and trustworthiness on the platform. You don’t want anyone who wants to make fast money on top of your head – especially if your money isn’t coming fast either. This sounds crazy, but if you can find a female driver, hire her. My experience with female drivers has always been positive and smooth – looked after vehicle, payments on time extremely responsible. I’ve never had a problem with any female drivers I have hired. Perhaps it is because they are scarce, and tend to book a lot of regular customers (similar females who feel safer in the company of a female driver) I don’t know – but this works for me. I tend to like to go for drivers with families. Not just because I want to support the family, but I find parents more responsible. Personally, I don’t go on personal recommendations so that I am not limited to the one person who could potentially scam me. I like to interview around 3 – 5 drivers and pick whoever my mind directs me to. I get requests from registered drivers daily, so if you want me to recommend any drivers to you, feel free to shoot me a personal e-mail (ctrl@mrpepe.com) and I will hook you up. Tip: If you have a “uniformed friend” who can come with you to the interview (he/she doesn’t really have to say anything or be disrespectful to the driver), invite them to come and just sit down in the background. There’s a subliminal message that will be inadvertently sent by this. A weekly check-in is something that I arrange with my drivers to balance accounts. Once you have picked a driver to hire, this is a very important ongoing process to keep your driver in check, and also to secure your peace of mind and help you keep on top of your investment. During this visit(which I hold in my house), I check that the vehicle is still in good condition, ask the driver how the week went, and balance up the accounts. At this visit, I open my spreadsheet and record the amount that the driver has paid for the week just gone by. I have some drivers who pay over the agreed amount because they want to complete their payments quickly, so it is very important to keep these records. If you can survive without touching the money at all, don’t touch it at all. I can guarantee you that this sort of money is sweeter to touch at the end, once the payments have been completed. I tend to keep my payments in a savings account and pretend it’s a fixed deposit that’s yielding 3x what normal fixed deposits yield. Every Tuesday, Uber pays directly into its partners accounts for the week just passed. Remember that Uber deducts a 25% fee from all bookings, so for all the passengers who paid by card, this is deducted automatically. For passengers who pay by cash, this fee is deducted from the balance from the card payers on your account. This is why it is important to reconcile accounts weekly, with your drivers. That’s it. I have laid out my experiences bare for you to see. I apologise for it being a bit long, but I had to put down as much that can help people as possible. Lt me know in the comments section below if you find this useful at all, or if you have any questions or suggestions which you would like me to add. nice article. im presently running a fleet management company. got a deal to put 100cars on the electronic ride sharing platforms before the end of the year im on 30 plus right now. But when i did my research i found out the same thing you had shared. higher purchase is the way to go. so i get cars from clients put it up for higher purchase of over 40% to 50% depending on the year and state of car preferably tokunbo. we spread the new calculated cost of the car over 18 to 24 to 30 months,depending on cost.Im able to thrive with this module because i have a network of over 100 drivers waiting in line for the higher purchase deal. this is better than the conventional fixed deposit rates the banks offer you over 2 years. Im presently running a fleet management company. got a deal to put 100cars on the electronic ride sharing platforms before the end of the year im on 30 plus right now. But when i did my research i found out the same thing you had shared. higher purchase is the way to go. so i get cars from clients put it up for higher purchase of over 40% to 50% depending on the year and state of car preferably tokunbo. we spread the new calculated cost of the car over 18 to 24 to 30 months,depending on cost.Im able to thrive with this module because i have a network of over 100 drivers waiting in line for the higher purchase deal. this is better than the conventional fixed deposit rates the banks offer you over 2 years. This is an eye-opener into this UBER business. I have a. MAZDA Tribute 2002 model which i would like to have onboard but i seem to mostly get negative vibes based on it being an SUV, with particular reference to fuel consumption. Please i would appreciate u shed mor light on this as i am almost not processing further. All the same, can i get referals for drivers too. Most appreciated. I am commenting to let you understand what a fantastic discovery our daughter found viewing your web site. She learned a lot of things, which include what it is like to have an excellent giving spirit to make other people quite simply know just exactly some tricky things. You truly exceeded readers’ expectations. I appreciate you for offering the practical, healthy, explanatory and also fun tips about your topic to Kate. Thank u for the information it was very useful for me but what I want to know is how is the week of work day like is it mon to Friday or mon to sunday….. Or how many days makes d week a driver works for?